One of my favorite things to do when I have some spare time is to visit Raleigh Botanical Gardens. I love the new perennial and annual plants that I learn about and it just de-stresses me like nothing else seems to do. 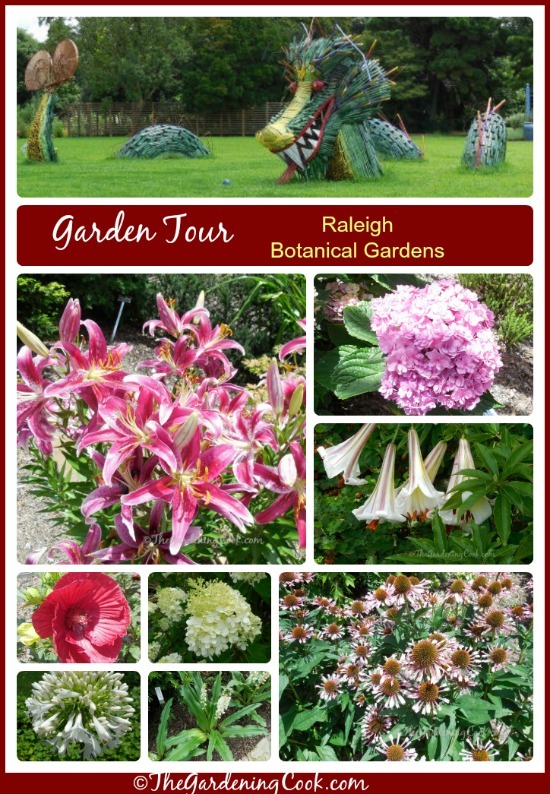 Raleigh has a great Botanical Garden called JC Raulston Arboretum. The beauty of these botanical gardens is that plants displayed there are all suitable for growing in the south east USA. Since I live in Raleigh, it gives me great ideas for new plants to try to procure with no worry that they won’t be suitable to our climate. I made a visit to the gardens late last summer when the flowers were abundant. 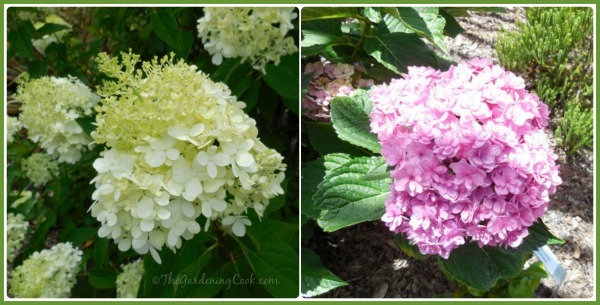 Here is the result – a slide show of plants all suitable to North Carolina. Grab a cup of coffee and enjoy! The show starts with my favorite. 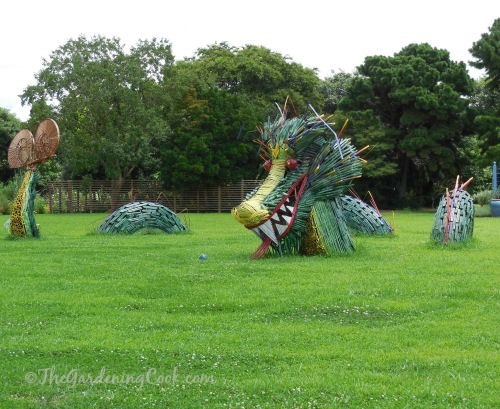 This gorgeous display of dragons which seem to be swimming in the lawn are at the entry of the Botanical Gardens. Very popular with all the visitors and so colorful! 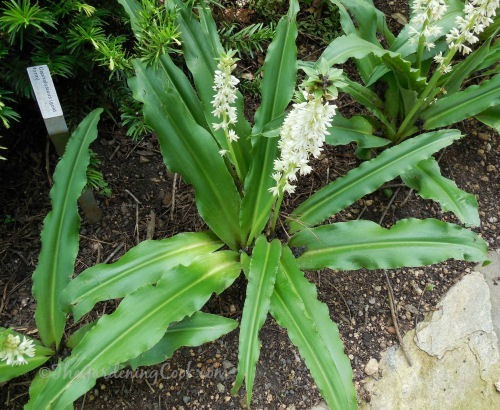 This lily is a Eucomis autumnalis – more commonly called a pineapple lily. I love the white flower stalk rising above those bright green leaves. It looks almost like lily of the valley! 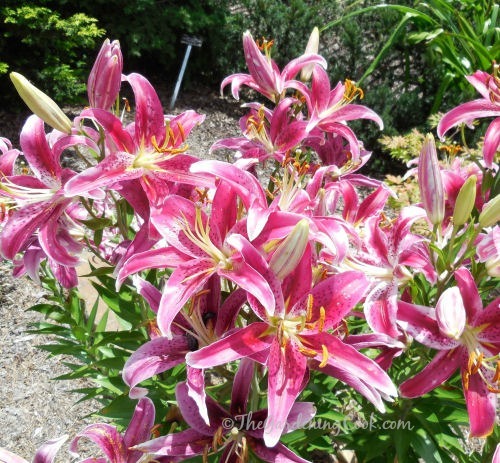 Wouldn’t you love this show of lilies in your yard? 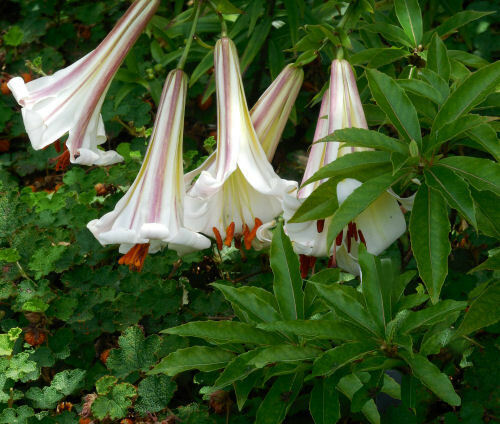 The name of it is Lillum “Kissproof.” This lily is hardy in zones 4-8 and can tolerate full sun to part shade. I love the whimsical name too! A zone 7 hardy Hibiscus! At last. All of the hibiscus plants that I have purchased here in Raleigh have been semi tropical and will not over winter. 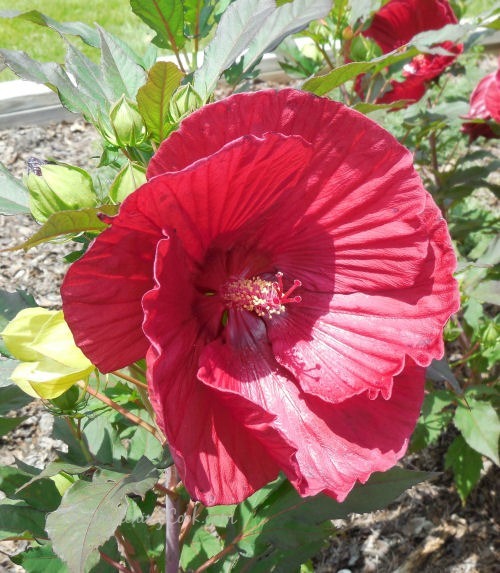 This variety is Hibiscus SUMMERIFIC var. ‘Cranberry Crush’. I’ll be on the look out for it this year. It is hardy in zones 4 to 9, so it can be grown a bit further north too! This beauty is an Angel’s trumpet – Brugmansia. I love the pink and white candy cane striped flowers and they were huge! Can’t wait to find these. 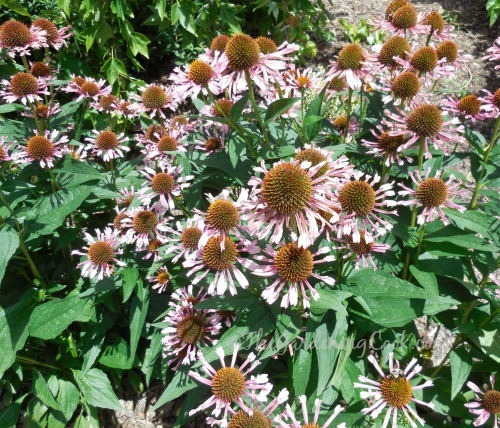 What perennial garden would be complete without a cone flower? This variety is called Echinacea “Quills N Thrills” and the seedpod tells why the name has quills in it. It is almost like a hedgehog! Hardy in zones 3-8. 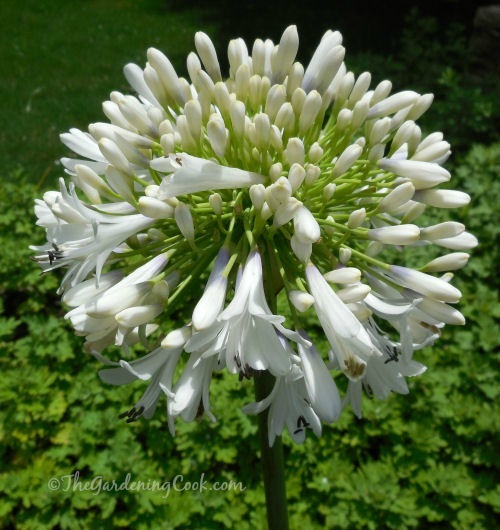 My final photo (for today) is a showy Agapanthus from the White Gardens at the Arboretum. It’s a Acanthus Orientalis and is also called White Lily of the Nile. Stay tuned for more photos in another post. I could not stop taking photos while I was there! If you enjoy touring Botanical gardens, be sure to put Wellfield Botanic Gardens in Indiana, and Beech Creek Botanical Garden and Nature Preserve in Ohio on your list to visit, too. Love, love, love.. Great post…almost like being there…Thank you for sharing! Thanks Judy. It is a very special place. I can’t wait to go back again! I my self have the angel trumpet, I’ve had the double blooming purple (absolutely gorgeous) and the pink and white that you have pictured. None, however smell as delightful as the yellow one. It is an intoxicating, delightful scent, most apparent in the evening, night time. I highly recommend the yellow, if you’re in the market for one. I bought mine in 2008, have had it in pots, on the ground, cut clippings & made babies of them. So worth the money, oh! For those of you that are up north, they do well inside in a pot, make sure they get plenty of daylight but don’t scorch them. They can take sun, but partial is better.